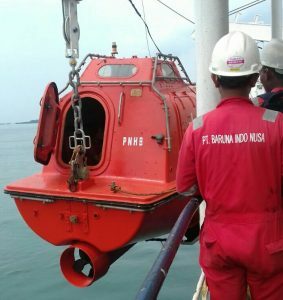 Baruna Indo Nusa team of qualified and experienced personnel provide annual and 5 yearly inspection and maintenance services at short notice, 24/7, in accordance to IMO 1206/rev.1. Our service stations also possess necessary equipment to conduct load tests and on-voyage repairs. 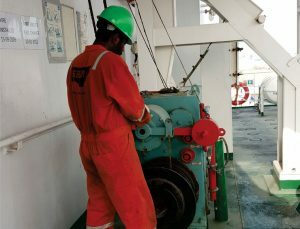 Our advanced service stations and repair facilities are well equipped to carry out complete servicing, overhaul, and repair of Engine and Sprinkler Systems, FRP Hull & Body, Release Gear, Davit and Winch, Fall Wire renewal, and Hydrostatic testing and refilling of compressed air systems. We also offer replacement equipment for hire during the overhaul stage, subject to availability. Our in-house engine experts conduct complete engine overhauls and refurbishment during the five yearly service. We have in-house capabilities to lifeboat exterior fittings such as handles, hatch covers, etc. 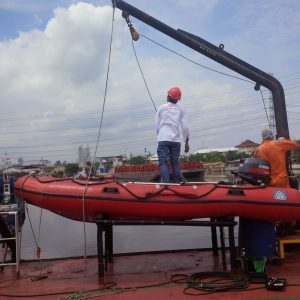 We have the capability of renovating and repairing all exterior and interior sections of the lifeboat. 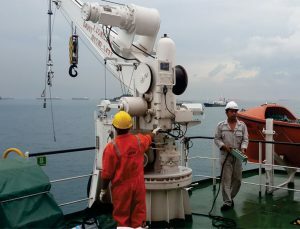 We also offer similar services for davits and winches. 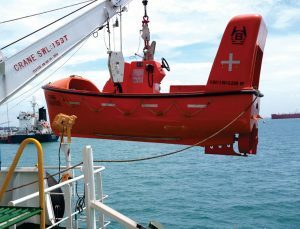 In accordance to IMO 1206/rev.1, all rigid and inflatable rescue boats also are to be subjected to the annual and 5-yearly inspection and maintenance routines as described before. 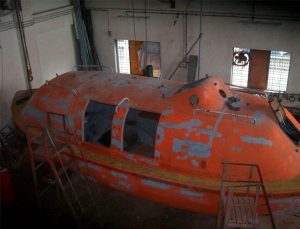 An additional pressure test of the buoyancy chamber of the inflatable rescue boat is required as per manufacturer’s guidelines. Our service engineer inspecting a rescue boat release hook during an annual inspection. These hooks are usually required to be overhauled by the manufacturer during the five yearly routine. 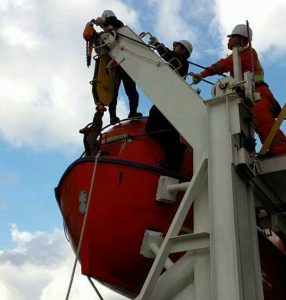 Iflatable rescue boats need to be launch tested after the annual inspection to ensure the lifting slings, connector points, and release hook are all in satisfactory working condition. Our team conducting a periodic inflation and pressure test of a rescue boat at service station.